Law Enforcement and Public Safety professional is a government employee who is a sworn officer of the city or county or state who acts in an organized manner to enforce the law by prevention, investigation, apprehension, discovering, deterring, rehabilitating or punishing people who violate the rules and norms governing that society. Police Officers, Detectives, City Police Department Employees, Government employees & contractors working in fire department, Law enforcement, Emergency medical technicians, Public health officials, Hazardous materials professionals, Public safety communications representatives, Public works officials, Emergency managers, Justice & court employees, Department of corrections, FEMA, FBI, U.S. Marshals and others. This is comprehensive training for employee/owner who is designated as a compliance officer. This person is responsible for ensuring that the company is HIPAA compliant. After the training officer shall have a better understanding and will be able to oversee all ongoing activities related to the development, implementation and maintenance of the practice/organization’s privacy security policies and standards in accordance with applicable federal and state laws. To avoid civil money penalties and criminal penalties related to non-compliance with HIPAA and other associated acts, it is essential to have a comprehensive understanding of these acts. 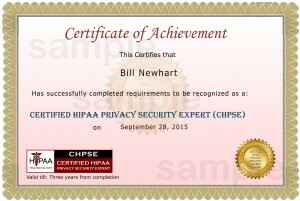 With CHPSE, advanced training in the areas of HIPAA Security rule & Privacy rule is imparted. This type of training is critical for compliance officers, consultants, and business associates who work in the healthcare industry. This is an entry-level certification that provides basic understanding of HIPAA. CHPA training is targeted towards those individuals (new employees, students, etc.) who are only required to have fundamental knowledge of HIPAA and not advanced. CHPA Course & exam are now available in Spanish also.